Hi, my name is Alana and I love being a Girl Scout because it provides me with an outlet where I can be myself and make a difference in my community. Having a Girl Scout troop also gives me a group of life long friends that I can continually rely on. I don’t have to fear being judged by them for the clothes I wear or the way I style my hair because I know they embrace me for me. Throughout my 11 years as a Girl Scout I have made friendships that have lasted. I first moved to Sacramento when I was in 1st grade and the first thing my mother did was enroll me in a Girl Scouts. It made the transition to a new town much easier because I knew that I had a group of girls that would help me through the first day. I met my best friend Jane through Girl Scouts. She was in my troop and we happened to live in the same neighborhood. 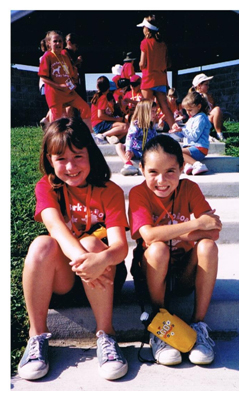 Our parents enrolled us in many of the same Girl Scout day camps and we went to many of the same Girl Scout events. After about a year I started attending the same school Jane went to and we were in the same class. Being able to spend time together in school and outside of school really allowed us to see every side of each other. As time went on our friendship grew stronger and stronger, and today I know that she’ll always be there for me. I never have to fear going through everyday life without someone whom I can confide in and whom I know has my back. Without Girl Scouts we would never been able to make such a deep connection and maintain our friendship for so many years. Jane and I as young Girl Scouts. Jane and I today. BFFs!